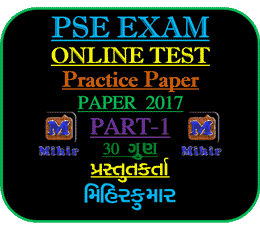 Here is very useful PSE Exam Practice Online Test Paper Created by Mihirkuamr. It is useful to all student who give this exam. this test is play on computer tablet and Also Mobile. In this test 30 Marks Also give Part One Test is 30 Marks. Also Part 3 is coming Soon. here is Paper of PSE Online Test, Here is Information About PSE Apply Online PSE Online 2018,PSE Scholarship Exam 2018, PSE Scholarship, PSE Exam Syllabus, PSE Login, PSE 2017-18, PSE Exam 2017, PSE Exam 2018. Here is useful information about PSE. Here is very useful PSE Online Test Created by Mihirkuamr. It useful to all student how give this exam. this test is play on computer tablet and Also Mobile. In this test 30 Marks Also give Part One Test is 30 Marks. Also Part 3 is coming Soon. here is Paper of PSE 2017 this is digital Format Test. Student Participate in this test and learn how to give this test. Only give three deatil and Test is start one Full Name, School Name, And District Also give If you out of state Gujarat Select Other option and type your State and District Name in this Box. If you like this post and Test Please Give your Valuable Feedback to us. Give Feed back two to give a Feed back one is when you submit this test you get link in this last click on this and Give your Feedback Also you Give Feedback come on this site and click on Contact us option list Feedback link and give your valuable Feedback. Thanks a lot to connect with us.